Macon, Georgia: J.W. Burke Company, 1912. First Edition. hardcover. Very Good. 137+72 pages. Gray cloth wih titles on cover in black on white background with a black border, spine titles embossed in gilt. Spine a bit dull, corners bumped, light spine wear and touch of soiling to cover. Textblock square, binding tight. Bookplate and name card on inside pastedown, previous owner's name and dated San Francisco, 1921 on front endpaper. Text clean, bright, no marks. 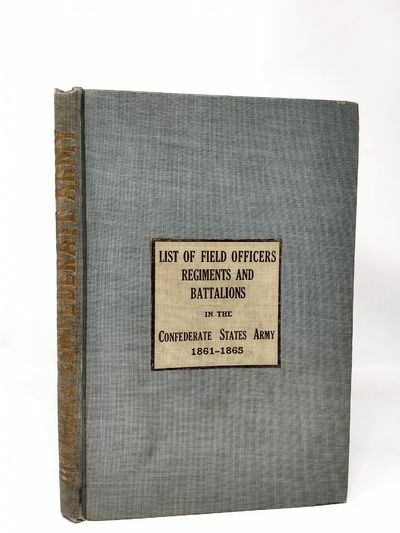 First 137 pages presents the officers in alphabetical order and lists their regiment, this is followed by 72 pages listing the Confederate States in alphabetical order and giving a listing of their regiments. Note: This is the original edition, not a reproduced photo copy. Scarce.